MSP® definition MSP® qualifications and training What should I do next? How MSP® can benefit you? 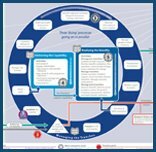 Managing Successful Programmes (MSP®) is a methodology that comprises a set of principles and processes for use when managing a programme. A programme is made up of a specific set of projects identified by an organisation that together will deliver some defined objective, or set of objectives, for the organisation. The objectives, or goals, of the programme are typically at a strategic level so that the organisation can achieve benefits and improvements in its business operation. Take advantage of the latest accredited Managing Successful Programmes courses on offer from ILX Group.